Watch this helpful video to learn more about the ONFI Savings and Support program, which offers eligible patients with commercial insurance a 14-day free trial of ONFI as well as copay assistance. The video also explains how to get the free trial and the copay savings card. IF YOU QUALIFY, YOU WILL BE ELIGIBLE FOR A 14-DAY FREE TRIAL AND COPAY SAVINGS! Want to access your free trial voucher and ONFI copay savings card? Already have an ONFI copay savings card? Need help? Get answers to your questions by calling the ONFI Support Center at 1-855-345-6634. General Terms and Conditions: Only commercially insured patients age 2 and older whose insurance policy provides coverage for ONFI® (clobazam) CIV and who are not reimbursed for the entire cost of the prescription are eligible for the 14-Day Free Trial voucher or copay assistance (the “Offers”). Patients are not eligible for the Offers if they are self-pay or if the prescription is eligible to be reimbursed, in whole or in part, by any state or federal health care programs, including but not limited to Medicare or Medicaid, Medigap, VA, DOD, or TRICARE. In addition, patients may not use the Offers if they are Medicare-eligible and enrolled in an employer-sponsored health plan or prescription drug benefit program for retirees. 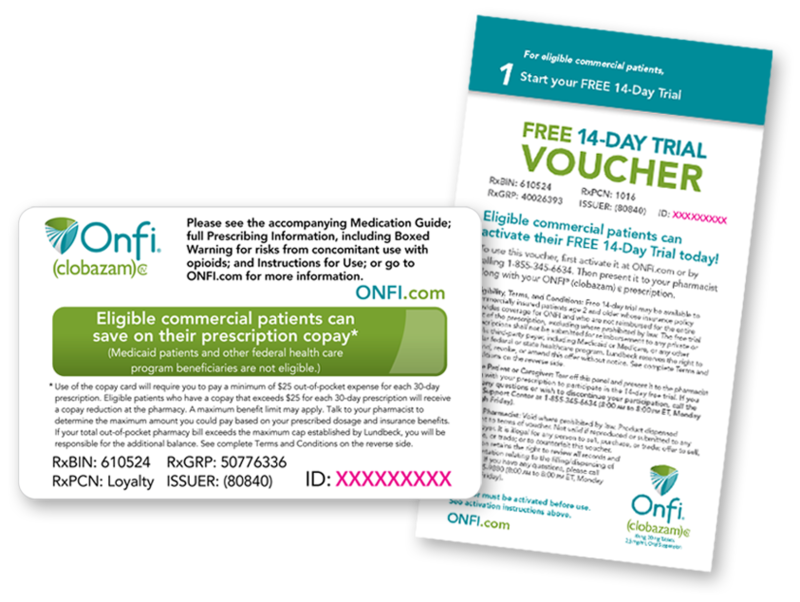 Offers are valid only for use with a valid prescription for ONFI at the time the prescription is filled by the pharmacist and dispensed to the patient. Offers apply only to prescriptions filled before the programs expire. The free trial and copay prescriptions shall not be submitted for reimbursement to any public third-party payer, including Medicaid or Medicare or any other similar federal or state healthcare program; in addition, the free trial prescription shall not be submitted to any private third-party payer. Patients are responsible for complying with any obligations or requirements imposed by their insurance plans. The Offers are not transferable. The selling, purchasing, trading, or counterfeiting of the Offers is prohibited by law. The Offers have no cash value and may not be used in combination with any other discount, coupon, rebate, free trial, or similar offer for the specified prescription. Lundbeck reserves the right to rescind, revoke, or amend the Offers without notice. Offers are intended to comply with all applicable laws and regulations, including, without limitation, the federal Anti-Kickback Statute, its implementing regulations, and related guidance interpreting the federal Anti-Kickback Statute. Offers are not health insurance. Offers are valid only in the USA where allowed by law. There is no future purchase requirement associated with the Offers. Patient questions and requests to discontinue participation in the programs can be directed to 1-855-809-5818 (8:00 AM-8:00 PM ET, Monday through Friday). 14-Day Free Trial Terms and Conditions: To participate in this program, eligible commercially insured patients age 2 and older must present the 14-day Free Trial voucher to the pharmacist along with their valid prescription. By participating in the 14-Day Free Trial, the patient acknowledges and agrees that he/she is eligible to participate and that he/she understands and agrees to comply with the General and 14-Day Free Trial Terms and Conditions. Copay Assistance Terms and Conditions: Eligible patients must present their activated card to the pharmacist along with their valid ONFI prescription to participate in this program. The offer is valid for up to 12 prescription fills of a 30-day supply each. Use of the Copay Assistance program will require patients to pay a minimum of $10 out-of-pocket expense for each 30-day prescription. To be eligible, patients must have a copay that exceeds $10 for each 30-day prescription. A maximum benefit of $600 may apply for each 30-day prescription. If the patient’s total out-of-pocket pharmacy bill exceeds the cap established by Lundbeck, the patient will be responsible for the additional balance. Patients should talk to their pharmacist to determine the maximum amount that they could pay based on their prescribed dosage and insurance benefits. By participating in the Copay Assistance program, the patient acknowledges and agrees that he/she is eligible to participate and that he/she understands and agrees to comply with the General and Copay Assistance Terms and Conditions. Patients who have limited resources and who do not have insurance coverage for ONFI may qualify for assistance through the Lundbeck Patient Assistance Program. Eligibility criteria may apply. Call the ONFI Support Center at 1-855-345-6634 for more information. Informational Support provided through the Lundbeck ONFI Support Center (“Informational Support”) is available for eligible ONFI patients only. Informational Support should not replace conversations between patients and their health care providers or their office staff, is not insurance or a guarantee of coverage or assistance, and has no independent value. Patients are eligible for Informational Support if they have a valid prescription for ONFI and a request is submitted to the ONFI Support Center using a completed ONFI Insurance Information Form. Informational Support includes insurance coverage information related to ONFI and, depending on patient eligibility, information regarding other Lundbeck patient support programs. Separate applications may be required for Lundbeck programs to determine patient eligibility. There may be other ways for patients to obtain assistance verifying insurance coverage for, and/or affording the cost of ONFI. Questions regarding other possible sources of patient support should be directed to the patient’s health care provider. There is no purchase requirement associated with Informational Support. Informational Support is only provided in the USA where allowed by law. Informational Support is intended to comply with all applicable laws and regulations, including, without limitation, the federal Anti-Kickback Statute, its implementing regulations, and related guidance interpreting the federal Anti-Kickback Statute. Lundbeck reserves the right to rescind, revoke, or amend Informational Support without notice. Questions regarding Informational Support that may be available to a patient and opt-out requests should be directed to the ONFI Support Center: Monday-Friday, 8:00 AM to 8:00 PM ET. 1-855-809-5818. *Separate terms and conditions created for commercial voucher (ONFI) and co-pay assistance programs. Download this guide to help you start the conversation with your doctor about staying on brand-name ONFI.